This is a fine Technicolor pirate epic, grand and satisfying, the story carried by the energy of its three marquee stars and a surprise stand-out fourth. Paul Henreid, best known as Victor Laszlo in Casablanca, is the heroic lead, a Dutch ship captain who is caught and enslaved when a storm drives his peaceful ship aground in Spanish colonial waters. He escapes and becomes a feared pirate captain known as the Barracuda, preying exclusively on Spanish shipping. You might not think the stiff and rather serious Henreid could buckle a swash like Errol Flynn or Tyrone Power, but you’d be wrong: his Captain Barracuda displays an edge of mocking arrogance that enables him to command buccaneers and defy Spaniards, he looks good in pirate garb, and he knows what to do when you put a sword in his hand. 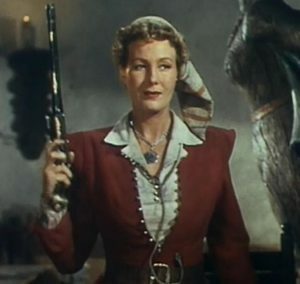 The Barracuda captures a Spanish ship bearing our second star, the radiant Maureen O’Hara as the Condesa Francisca, on her way to marry the Viceroy of New Granada—who is the particular target of the Barracuda’s campaign of revenge. When he meets Francisca, sparks fly, and he decides to marry her just to spite the viceroy—or is there another motive? The condesa initially refuses, but then she finds a reason of her own to agree, sort of. The two maneuver around each other into marriage like a pair of tall ships tacking in to a boarding action. Here, as with her rôle in The Black Swan, O’Hara has to find a means to give herself away without giving herself up. She does, and O’Hara has the chops to make you believe it. The viceroy, Don Juan, isn’t happy about any of this, but when Don Juan is unhappy, we’re delighted, because he’s played by Walter Slezak, and we like him when he’s angry! Slezak is basically reprising his governor’s rôle from The Princess and the Pirate, but the viceroy is much smarter, more menacing, and equipped with a wicked sense of humor. He’s quick-witted, mean, and oozes contempt for his inferiors, i.e., everyone. It takes everything the Barracuda and Francisca have to defeat him, and even so it’s a near-run thing. But before our two romantic leads run afoul of the viceroy’s final trap, they put in to Tortuga for some roistering, revelry, and a spot of getting-betrayed-by-your-allies-because-what-do-you-expect-from-pirates? One of these allies is Binnie Barnes playing the historical female pirate Anne Bonny, and The Spanish Main is worth watching for her alone. This is, I believe, the first appearance of Anne Bonny on screen, and in Barnes’s portrayal she’s tough, jealous, but fiercely independent, and takes no guff from anyone. In this she resembled Barnes herself, who had a long career in the movies from the 1920s to the ‘70s, but always refused to play submissive rôles: anything, she said, “as long as I don’t have to be a sweet woman.” Amen to that.